Friday, October 2, 2015 • 8 p.m.
Grammy®-winning Eighth Blackbird promises—and delivers—provocative and mind-changing performances to its burgeoning audiences. The group combines the finesse of a string quartet, the energy of a rock band and the audacity of a storefront theater company. The Chicago-based sextet is both strikingly virtuosic and disarmingly irreverent, as they devote themselves to inspiring and performing today’s master classical composers and debunking the myth that contemporary music is only for a cerebral few. The ensemble holds residence positions at the Curtis Institute of Music, University of Richmond and University of Chicago. A decade-long relationship with Chicago’s Cedille Records has produced six acclaimed recordings. The ensemble has won three Grammy® Awards, for the recordings strange imaginary animals, Lonely Motel: Music from Slide and Meanwhile. Wednesday, September 30, 6:30 PM. Harper Hall, Lawrence University. Thursday, October 1, 4:30 PM. Harper Hall, Lawrence University. Tuesday, October 13, 2015, 8:00 p.m.
Singer Pur (“Pure Singing”), hailed as one of the finest vocal ensembles in the world, brings its unique sound and superb musicianship to Lawrence in The Sound of Beauty, a program of the most beautiful choral music being composed today. The three-time winners of the Echo-Klassiek Prize—the German “Grammy”—will perform an all-a cappella program that ranges from contemporary compositions inspired by the great Renaissance cathedral choirs of Europe to the music of Sting. Founded by former members of the renowned Regensburg Cathedral Boys’ Choir, the vocal sextet has dazzled audiences in more than forty countries worldwide, including world premiere performances at Europa Cantat, Schleswig-Holstein Music Festival, York Festival of Contemporary Music, and the Schwetzinger Festspiele. Saturday, October 31, 2015, 8 p.m.
Richard and David's program centers on a digital realization of Stockhausen's Solo, an open form work for flute with live electronic feedback—the flute plays against recorded loops of itself, transformed in ways which open up new formal and tonal possibilities. Solo is a piece which has rarely been heard in recent years not least because of the analog technology for which it was designed being unavailable, and this realization is an entirely new one created by the performers. Also on the program are new works by Patricia Alessandrini and others, plus the U.S. premier of a new work by David, exploring the tonal possibilities of the instrument both through Richard's virtuosic live performance, and complex live electronic transformation via filtering and spatialisation triggered by the tiniest details of the live part. Richard Craig studied flute at the Royal Conservatoire of Scotland with Sheena Gordon and Richard Blake. After graduation, he continued his studies at the Conservatoire de Strasbourg, France, with Mario Caroli. Richard has performed with groups such as ELISION, Musikfabrik, Klangforum Wien and Das Experimental studio Ensemble, playing in international festivals such as Maerzmusik Berlin, Wittener Tage für Neue Musik, the Venice Biennale, Huddersfield Festival, the Festival D’Automne in Paris and the Lincoln Center in New York. Equally active as a soloist, Richard has given recitals throughout the world, commissioning both established composers and the younger generation. As a composer, musicologist and producer, David Revill has worked in countries such as Austria, Poland, Romania, Croatia, Canada, and particularly, in recent years, France, Germany, and the U.S.A. Compositional residencies include "Begegnungen" festival, Innsbruck (1999, 2003) and McKnight Visiting Composer (American Composers' Forum, 1997), portrait concerts at the Zagreb Biennale, "Dialogues" festival in Edinburgh (2002), "Sound" in Aberdeen (2007) and at the Birmingham Conservatoire (2014) in the U.K. Electronic work includes numerous visits to Heinrich-Strobel-Stiftung in Freiburg, Germany and residencies at C.C.MI.X. in Paris. As a producer, he has in recent years become increasingly in demand for his surround sound production.As a percussionist and live electronics performer, he has presented numerous first performances. He has also toured as a rock drummer, including an extended tour in the U.S. in 2000–2001. Since the fall of 2011, David Revill has been living and working in Baltimore, Maryland. David Kaplan, pianist, has been called “excellent and adventurous” by The New York Times, and praised by the Boston Globe for “grace and fire” at the keyboard. He has performed at London’s Barbican Centre, worked with the Orpheus Chamber Orchestra, and at Miami’s Arscht Center with Itzhak Perlman. This year alone, he makes recital debuts at Ravinia, Washington’s National Gallery, and more. David belongs to Decoda, the innovative Affiliate Ensemble of Carnegie Hall. David completed a DMA at Yale with Claude Frank, and studied conducting on a Fulbright in Berlin. Away from the keyboard, he loves cartooning and cooking, and is mildly obsessed with classic cars. David is proud to be a Yamaha Artist. 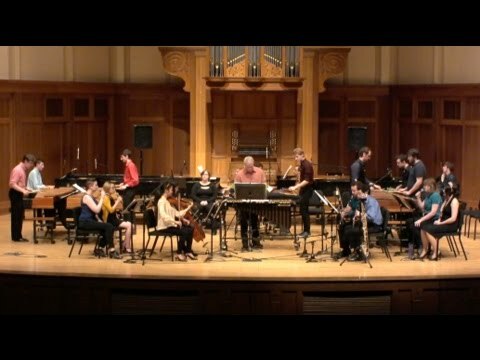 Lawrence students and faculty give a rare performance of Steve Reich’s seminal work Music for Eighteen Musicians to celebrate its 40th anniversary. Since its premiere on April 24, 1976, this hour-long work has enchanted and mesmerized listeners. Its use of subtly shifting sonorities against a background pulse came to define Steve Reich’s sound in the 1970s, and influenced a generation of composers. Come and experience this work live in the beautiful Lawrence Chapel!